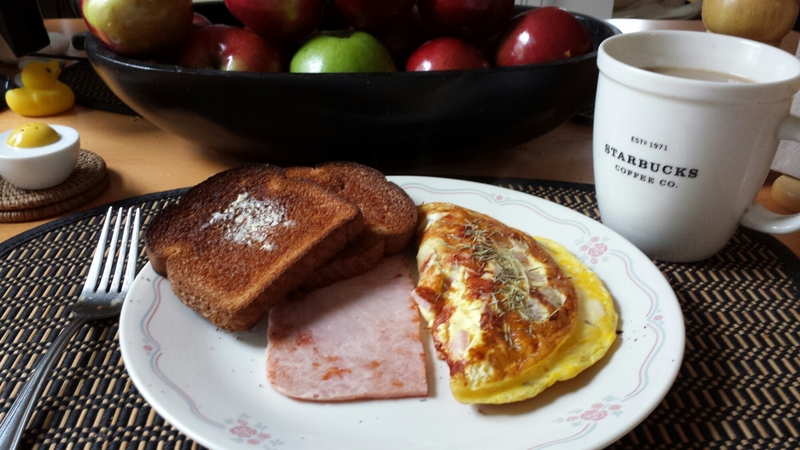 A nice warm omelette with ham, and Swiss cheese just at its melting point so that it still has the stringiness as you bring a fork to your mouth. I mix a pinch of herbs de provance into the mixture and then sprinkle a pinch on top as a garnish. I usually get the deli ham at Cherry Valley Market and have the clerk slice it in the thick side. Slicing it thick makes it much easier to pan fry. As a personal point of reference, I also like the cheese sliced thicker. In a mixing bowl I combine two eggs, herbs, and small-diced ham. I whisk these together with a splash of milk. Then I pour this into a non stick pan over low heat and cover. As this firms up I place a slice of the Swiss cheese along half and the using a thin non stick spatula I fold the omelette over and hold the pan off the stove but still over the burner. This gets the cheese melting without over cooking the omelette. over low heat, melt the butter, blend in the milk, then gradually add the grates cheese whisking to keep everything in motion. This makes your basic, ya very basic cheese sauce. Then, add in the cooked macaroni coating the pasta well. Then stir in the ham and diced jalapenos. Mix this well and pour it into a. oven safe baking dish. Bake this in the oven at 300 degrees for about twenty minutes. Remove from the oven, let it cool just a bit. Them spoon it out and enjoy that left over ham with the jalapenos… even if those jalapenos aren’t ‘on a stick’. Easter and large baked hams.. I really don’t know then these to things where paired up, but it seems every store out there is throwing hams at me. 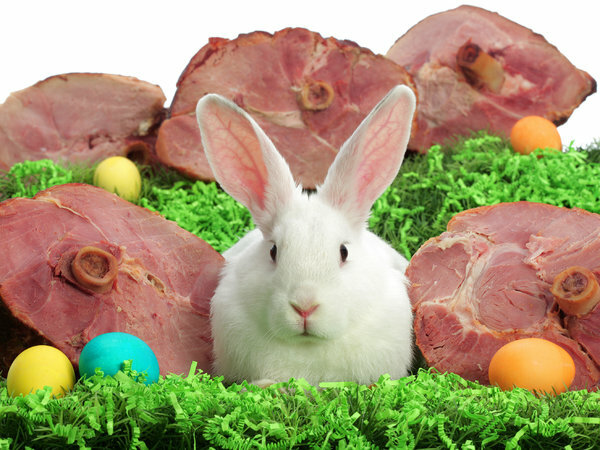 So there must be some reason why ham is so associated with Easter… maybe to ward off heathens. Well, here is a simple straightforward baked ham, the secret to getting it right is in the knife. Preheat oven to 325 degrees. Wrap ham completely with parchment-lined foil and place on a rimmed baking sheet or roasting pan. Pop it into the oven and bake for about 1 1/2 hours. Unwrap ham and toss out the parchment and foil. Now here’s the real secret to making those diamond shaped patterns in the fat. Use a utility knife, you know, like the sheetrock cutting knives, to score the fat in a diamond pattern, making the lines about 3/4 inch apart. The uniform depth of the blade makes uniform cuts in the fat. Transfer ham to a large roasting pan. Reduce oven temperature to 300 degrees. In a small bowl, mix together brown sugar and Cognac. Brush ham evenly with 3/4 of the brown sugar mixture and return to oven. Continue cooking the ham for an hour more. Then, brush ham with remaining brown sugar mixture and continue cooking 30 minutes more. Transfer to a serving platter until ready to carve. 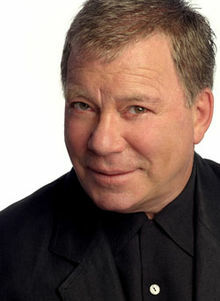 What’s better to keep you company during an original Star Trek marathon. When I think of these marathons, I think of hammy acting, cheesy scenes, and scalloped potatoes from right here on Long Island. I like to use a good amount of ham and cheese so as to make this side dish more of a one pot winter comfort food. So ‘beam me up Scotty’ ahead warp factor yum! 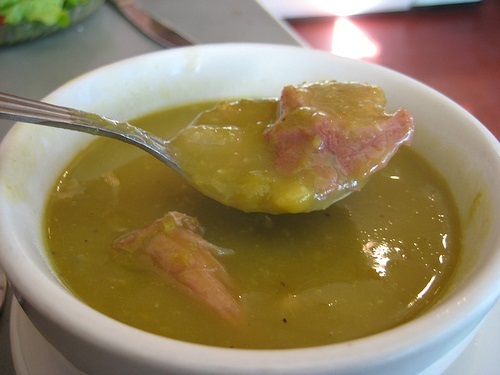 Cut ham in bite-size cubes and mix with the veggies in a large bowl. 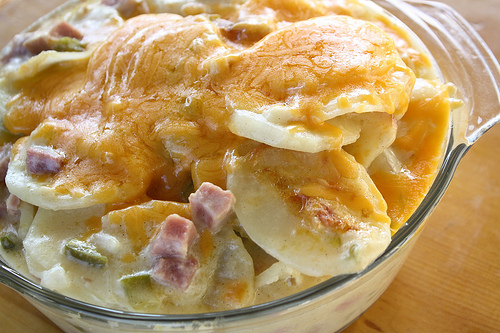 Place a layer of the potatoes in a greased 2-quart baking dish and sprinkle with some shredded cheddar, then a layer of ham and veggies, then a layer of potatoes and cheese, then a layer of ham and veggies, then a layer of… you get the picture. Combine the soup with milk and pour over potatoes. Cover with foil and bake at 350° for 1 hour. Remove covering; bake 30 to 45 minutes longer, or until potatoes are done. If desired, sprinkle even more shredded Cheddar cheese over the top of scalloped potatoes the last 15 minutes of baking time. Sit back and enjoy the warm cheesy goodness of Long Island’s comfort food.